Garve and District Broadband (GDB) was established in 2016 to bring faster and more reliable broadband to areas in our community with poor or no broadband (typically speeds less than 0.5Mbps). These are situated outside Garve and Strathgarve, which already benefit from a fibre cabinet and an upgraded exchange (to ADSL2+), implemented in early 2017. After exploring all options, GDB found that the ONLY solution for providing better and faster broadband in these areas is FTTP (fibre to the premises.) 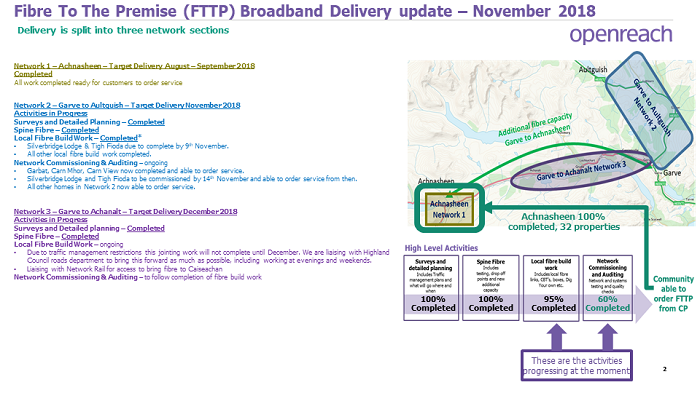 This was in part driven by a decision by BDUK / HIE (Broadband Delivery UK / Highlands and Islands Enterprise) to put FTTP into Achnasheen and Lochluichart. It was recognised that Garve village should be reviewed following Phase 3. This would establish what else needs to be done to get superfast / possibly ultrafast broadband to all Garve village. In December 2017 LCT agreed to fund Phase 1. The government through BDUK / HIE is funding about 60% of premises, and LCT through GDB is funding the rest. HIE is not funding all the premises because the government places a cap on its investment per property. LCT also agreed to fund some of Phase 2. More work was needed to understand the solutions and costs for the remaining remote premises in Phase 2. GDB signed contracts with BTOR (BT OpenReach) and HIE in January 2018 to deliver FTTP to most of the 133 premises from Achnasheen to Gorstan hamlet, and from Little Garve to Aultguish inclusive (Phase 1). BTOR completed the infrastructure build in December 2018. All premises, except the most remote, can now order fibre broadband. All but a few selfdigs have been completed. Many people have already ordered a fibre service. GDB has now agreed solutions for the more remote premises (Phase 2). FTTP will be taken to Luib and Strathvaich, subject to LCT funding. A satellite solution will be put into Fannich and Badavanich / Lubmore. Aultdearg does not currently wish to have any broadband solution. GDB is seeking an additional small investment from the LCT in December 2018 to complete Phase 2. GDB will contract with BTOR for these remote premises in 1Q 2019, subject to LCT funding. The work will be completed within 12 months of the signing date. Half the premises in Strathgarve are connected to cabinet 3, as are those between Garve hamlet and Gorstan. The other half of Strathgarve is on Exchange Only (EO, that is, they are linked via a copper line directly to the exchange, and not to a copper cabinet, making it more difficult to install fibre). Advertised speeds here for those properties connected to cabinet 3 are between 18 and 30 Mbps. For those premises on EO they are between 4 and 11 Mbps, but with a minimum under 2 Mbps. BTOR will provide GDB with solutions and costs for at least superfast broadband for these premises in March 2019. Subject to LCT funding, GDB will contract with BTOR for this work in 2Q 2019. The work will be complete within 12 months of the signing date. GDB has done an initial review of Garve village. - 11 are on Exchange Only but are being considered by HIE for an FTTP technical solution. (all IV23 2PS, Station Road; and all IV23 2PT, Lochview and Killin Farm). Advertised speeds here for premises linked to cabinet 3 are between 20 and 75Mbps depending on distance from the cabinet. For those premises on EO, they are between 8 and 19 Mbps depending on distance - not superfast, but still a reasonable speed. Several solutions could be employed in Garve village to deliver better broadband e.g. - HIE is currently tendering a project called R100 (Reaching 100% of premises with superfast broadband by end 2021). Many premises currently below superfast will be included in this project for delivery by end 2021 and funded by the government. - While GDB can contract directly with BTOR under their Community Fibre Partnership scheme (as we have done for Phases 1 and 2), BTOR tend to focus their limited resources on areas with poor broadband. Simply having the funds to be able to contract with them is not enough – they allocate their resources to projects on the basis of need as well. We have great news. BT OpenReach have commissioned all premises from Lochluichart to Achanalt. Everyone here can now order a fibre service. All 133 premises in Phases 1 and 2 of our project, from Gorstan to Achnasheen, and from Little Garve to Aultguish, except the most remote premises, are now enabled for a fibre service. BT Openreach has completed the job on time. Th next update will give you details of what's happening for the remote properties, Strathgarve, and Garve to Gorstan, and what we are looking at in Garve itself. So get ordering that new broadband service - you may get it in time for Christmas. There are still a couple of self digs still to be done. But there are around 15 self-digs which have been done and for which we have not yet had a grant application. THIS SELF-DIG GRANT SCHEME CLOSES ON 31 DECEMBER. We have to draw a line under this and bring it to a close. We can't let it hang on indefinitely. SO PLEASE, IF YOU WANT A GRANT, THEN GIVE US YOUR APPLICATION BEFORE THE END OF DECEMBER. GRANT APPLICATIONS AFTER THIS DATE WILL NOT BE PAID. It's all taking shape nicely - more premises can now order their fibre service! "...85 premises are now able to order a FTTP service, including three of those that had been delayed whilst we sought permission from the Forestry Commission..." - see map. Applications and invoices received after 31 December will not be processed/honoured. Finally, it was good to meet so many of you at the recent Development Company AGM - what a superb evening! All premises, except the following, are now ready for you to order a fibre service. OpenReach tell us these will be commissioned by end November 2018. GDB still has not received several selfdig grant applications. The deadline for getting these paid is end December 2018. GDB is working with property owners and OpenReach on Strathvaich, Luib, Badavanich / Lubmore and Fannich / Aultdearg. • Badavanich / Lubmore will be a satellite or network solution, not fibre. GDB is working to have solutions for these premises by end 2018. But it depends on how quickly OpenReach can provide costs and contracts. The intention is to apply for LCT funding in the December 2018 round where possible. This phase involves 16 premises in all, those in Strathgarve and four properties between Gorstan and Garve. GDB has walked through these premises with OpenReach. They have said that they will give us a plan, contract and price for these premises by end March 2019. If this is achieved, GDB will apply to LCT for funding in the March 2019 round. Deciding on a new service can be complicated. There are several providers, different services, various bundles, and a myriad of deals. And that’s before you consider what to do about broadband, line rental, linked TV, linked mobile, office facilities etc. OpenReach is only about the delivery of fibre infrastructure to your door. They can point you to suppliers, but they cannot give you specific reliable advice – even about BT. You can only get this advice by talking to your existing and new providers. And being clear about what you want from a new provider ie broadband, TV, mobile, landline etc. GDB has received further information from BT about BT Landlines. The issue is whether a BT landline number can be transferred to your new fibre service supplier (ISP). (Covered in our FAQs in May – see on this website, or at garve.org). The Achnasheen and Garve exchanges were upgraded to provide this transfer facility on 26 October 2018. BUT BT is not allowing us to do this yet because it seems they have teething problems elsewhere with the technology, and they want to link it to a general approach of getting rid of copper wire. And other providers, eg Zen, do not offer telephone over fibre yet – they may do in future. Therefore, in the short term it WILL NOT be possible to transfer a BT landline number to your new ISP. • Keep your existing BT copper landline and telephone number (with its line rental). You will need a broadband only service from your new ISP. • Get a broadband only service from your new ISP, ditch your BT landline and line rental, and rely only on your mobile. This is the most up-to-date information that GDB has currently. As ever, though, please check all these details out with your new provider – and get what they say they can offer you in writing before signing up! If you have had an issue moving over to fibre, then please sign up to the community hub website garve.org and post your issue and how you have got around it. Other people will benefit from your experience. But please – no rants! Keep it constructive. Please also share your experience of having fibre broadband and what difference it has made to your on-line life. Copyright Achnasheen and Garve dot com 2018. Ethereal theme. Theme images by RBFried. Powered by Blogger.